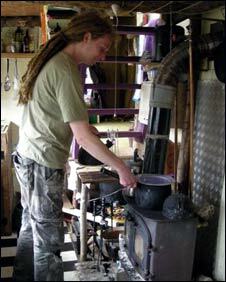 Members of an eco-community have appealed to be allowed to continue with their experiment in sustainable living. The Steward Community Woodland, on Dartmoor, is home to 11 adults and seven children. Temporary planning permission for the 32-acre site ran out in September 2007. Dartmoor National Park has refused to renew it. The community has appealed and a public inquiry is likely to be held later this year. Merlin Howse, who helped found the community eight years ago, said they were now in a difficult position because planning regulations do not take account of this kind of project. "We don't fit into any categories that they can allow," he said. "Part of the aim of the project is to challenge that system, and make it possible for people to live in a more sustainable way, on and with the land." The site is not connected to any mains services, apart from having a telephone line. Water comes from a spring. Electricity is generated through solar panels, as well as a micro hydro system which uses water from the spring to power a turbine. "We do have to be frugal with power at some times of the year, but at other times we can run little luxuries like laptops and slide projectors," said Mr Howse. Residents live in low impact dwellings, constructed of wood, canvas, blankets, boards and old windows. There is also a communal 'longhouse' containing a kitchen and sitting room. 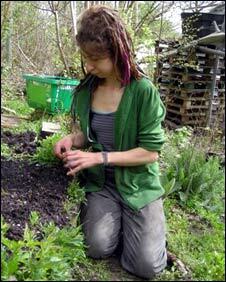 Meals are eaten communally, and residents work managing the woodland, running permaculture courses, and gardening. Income is generated from the woodland management and the courses, and some individuals work outside the community. All the adult members pay £32 weekly into a central kitty. Chrissie Tugwell, has lived at the community for 10 months and said the project had an important role to play. "We need to, as a society, explore ways of living off the grid and scaling down what we consume, because of the environmental circumstances that we find ourselves in at the moment," she said.